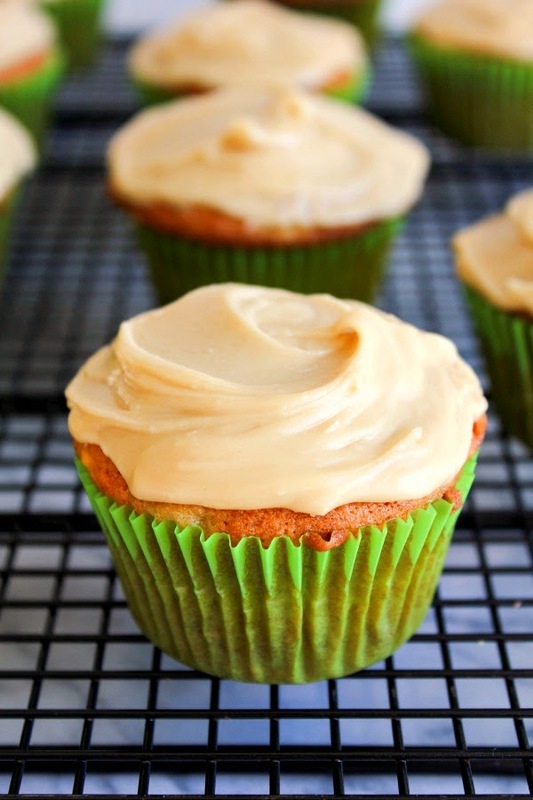 topped with a decadent brown sugar frosting! Thankfully for you I have an obsession with bananas. We've discussed this before (many times actually), but I cannot wait until my bananas get brown and soft and mushy. That means it's time to make something fun. Like banana bread. Or banana waffles. Or even banana ice cream. I take a simple, light and delicious cupcake and top it with the most ahhhhmazing frosting you'll ever have. Like seriously ever. I mean it. Just ask my kids. We could have taken three spoons and went to town on that bowl of icing. Just straight up ate it right out of the bowl. So good. And easy to make too. I pinky promise! So what are you waiting for? 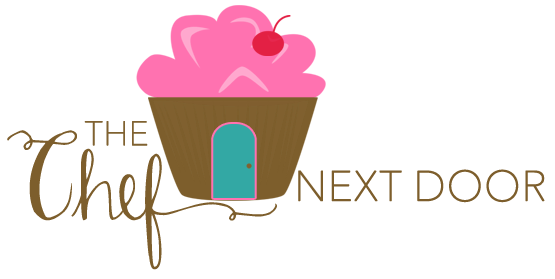 There are cupcakes to be made! Preheat the oven to 350 degrees. Line a 12-cup muffin pan with paper liners and set aside. In a medium bowl, whisk together flour, baking powder, baking soda, and salt. In the bowl of a stand mixer, beat the butter and brown sugar until light and fluffy. Add the eggs, one at a time, beating well after each addition. Add the vanilla and bananas and mix to combine. Slowly add the dry ingredients to the mixer, a little at a time. Do not overmix. Spoon the batter into the prepared muffin cups and bake for about 30 minutes, or until a cake tester inserted in the center of a cupcake comes out clean. 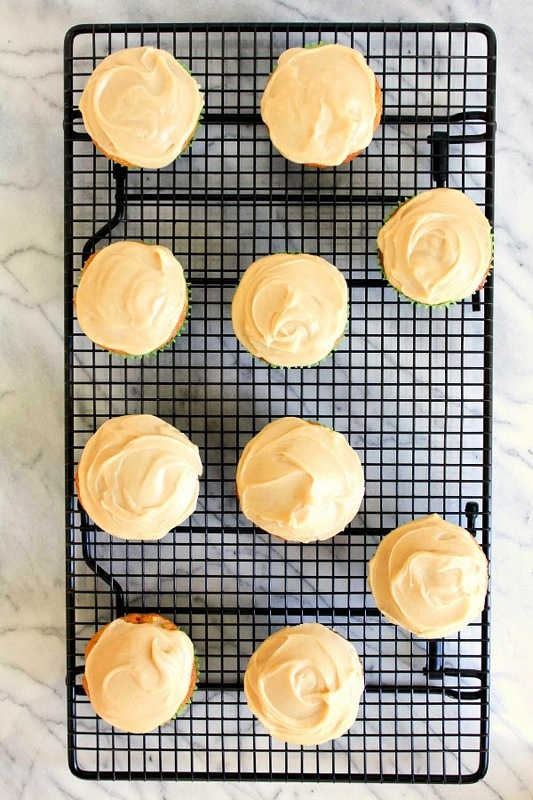 Remove the cupcakes from the pan and allow to cool completely on a wire rack before frosting. 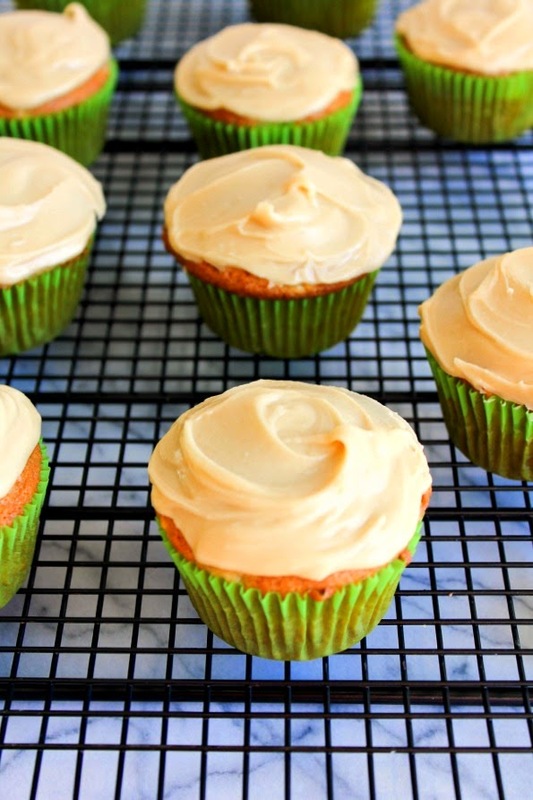 While the cupcakes are cooling, make the frosting. In a small saucepan, heat the butter and brown sugar over medium heat. Bring to a soft boil, then lower the heat and continue to cook for 2-3 minutes, stirring constantly. Add the milk and return to a boil, stirring constantly. Remove the pan from the heat and allow it to cool for about 15 minutes. Slowly add the powdered sugar and whisk well until smooth. Let it set up for just a few minutes, then frost the cooled cupcakes.